We forecast sales because we want to create a plan to allocate capacity and resources in the future and to meet customers demand for the right products and the right time. The sales forecast defines how much we expect to sell of a product at a given time. The estimates will define the level of warehouse inventory, which again will define timing of production and the number of materials to purchased from suppliers. A bad sales forecast will make a wrong allocation of capacities and resources, and impact the financial bottom line for a company. Sales forecasting is in other words about predicting the future sales as accurately as possible to improve and reach the financial goals and meet customers demand. 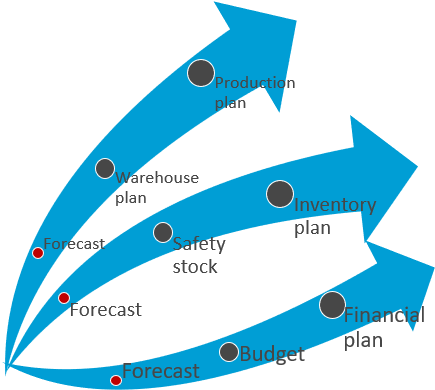 Figure 1 illustrate how other plans are linked and bounded to the sales forecast. 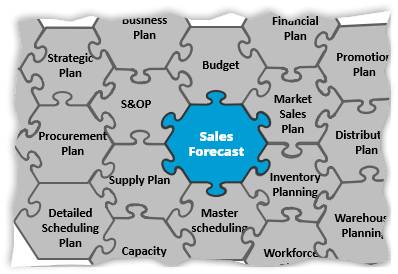 The sales forecast is the foundation for the S&OP plan, the business plan, the financial plan and the workforce plan. Wrong sales estimates will float into the other plans and make those plans less reliable. Allmost all plans in a company are affected by the future customer demands. When a plan is affected by customer demand we should start predicting the demand. Sometimes the prediction is fairly easy and you can accurate predict the future sales. In other cases the demand is erratic and hard to predict and produce rather inaccurate sales estimates. When sales is forecastable it makes sense to use the sales forecast in other plans. But when sales is erratic does it make sense to use it in planning? The clear answer is yes. The erratic sales should be supplemented by sales variation and then it makes sense to use it for planning. The most obvious case is in safety stock planning. By using both the average/median sales estimate and the variation of the forecast error we can set the safety stock so it exactly meets our service level given the sales variation. Hereby we can avoid stock out on one side and avoid setting the stock too high on the other side. We get the perfect trade-off.